Our latest papers have been published in EMBO reports. Take a look at the manuscript 2 here. 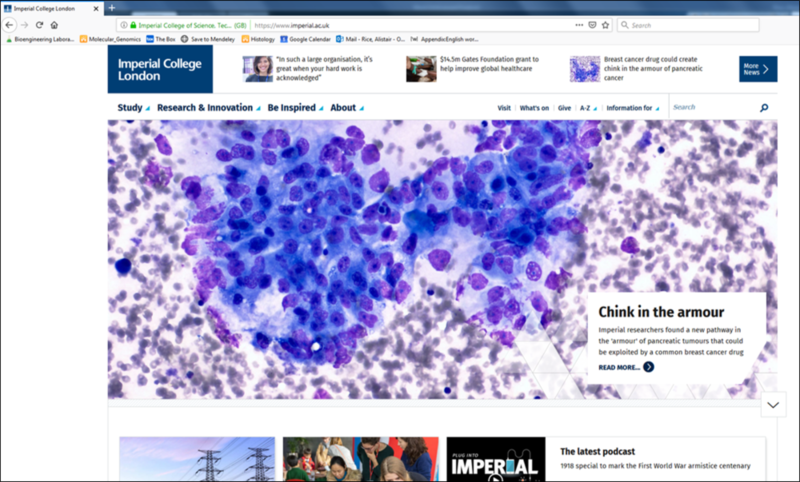 Our two latest papers, which look at repurposing tamoxifen from a breast cancer therapeutic to a pancreatic cancer therapeutic, have been featured on the Imperial College website today. Our latest papers have been published in EMBO reports. Take a look at the manuscript 1 here. 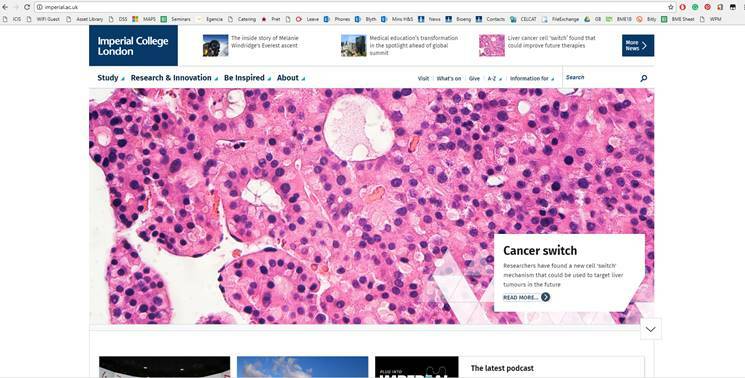 Our recent work, looking at how a vitamin A metabolite inhibits the mechanics of cells in the liver cancer microenvironment, has been featured on the Imperial College website. Our latest article, where we show how retinoic acid receptor beta (RAR-beta) is downregulated in liver cancer (HCC, hepatocellular carcinoma). We also show that expression and activation of RAR-beta inhibits cell mechanics, downregulating myosin expression and inhibiting the process of durotaxis. Mechano-induced conformational changes and the unfolding of protein domains are cornerstones of mechanotransduction and regulate the interaction of proteins with other molecules. 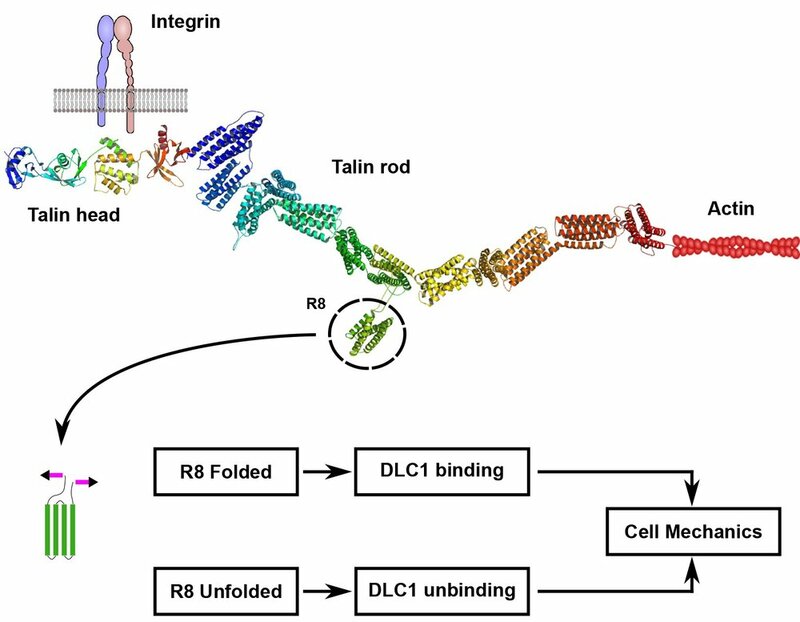 Talin is a prominent molecule in focal adhesions and one of the few proteins that simultaneously connects integrin receptors in the cell membrane with the actin cytoskeleton. This bridging position, owing to the cytoskeleton’s contractile nature, exposes talin to forces along its length. In this work, we studied the implications of the R8 domain unfolding in the downstream activity of deleted in liver cancer 1 (DLC1), which binds the talin R8 domain and negatively regulates Ras homolog family member A (RhoA). We created a talin mutant with the R8 domain resistant to mechanical unfolding and observed that cells expressing these talin mutants have altered patterns of focal adhesion dynamics and lower levels of actomyosin contraction. This leads to decreased traction forces and diminished cell migration. We propose a novel force-controlled molecular switch that refines the mechanism of talin-mediated focal adhesion activation, providing negative feedback during focal adhesion maturation. The broader effects of this talin-mediated mechanism need to be elucidated, as it might regulate multiple cellular events. To read the article click this link. To see a video explaining the findings click here. Congratulations to Antonios on passing his viva. Way to go, Dr Chronopoulos! Our latest paper, published in Oncogenesis. Increased matrix rigidity associated with the fibrotic reaction is documented to stimulate intracellular signalling pathways that promote cancer cell survival and tumour growth. Pancreatic cancer is one of the stiffest of all human solid carcinomas and is characterised by a remarkable desmoplastic reaction. Here, we use mouse models genetically engineered to recapitulate human pancreatic cancer, and several pancreatic cancer cell lines as a model, to investigate the effect of matrix stiffness in epithelial-mesenchymal transition (EMT) and resistance to chemotherapeutics. We found that recapitulation of the fibrotic rigidities found in pancreatic cancer tissues promote elements of EMT including increases in vimentin expression, decreases in E-cadherin expression, nuclear localisation of β-catenin, YAP, and TAZ, and changes in cell shape towards a mesenchymal phenotype. We also report that stiffness induces chemoresistance to paclitaxel, but not to gemcitabine, both commonly used therapeutics, suggesting that environmental rigidity underlies an aspect of chemoresistance. Our latest paper, published in Scientific Reports. Read it here. Pancreatic Ductal Adenocarcinoma (PDAC) is an aggressive malignancy characterised by the presence of extensive desmoplasia, thought to be responsible for the poor response of patients to systemic therapies. 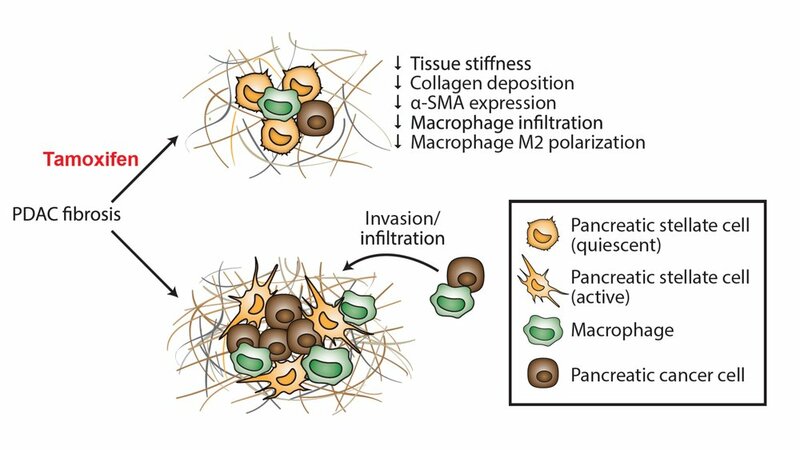 Pancreatic stellate cells (PSCs) are key mediators in the production of this fibrotic stroma, upon activation transitioning to a myofibroblast-like, high matrix secreting phenotype. Given their importance in disease progression, characterisation of PSC activation has been extensive, however one aspect that has been overlooked is the mechano-sensing properties of the cell. Here, through the use of a physiomimetic system that recapitulates the mechanical microenvironment found within healthy and fibrotic pancreas, we demonstrate that matrix stiffness regulates activation and mechanotaxis in PSCs. We show the ability of PSCs to undergo phenotypic transition solely as a result of changes in extracellular matrix stiffness, whilst observing the ability of PSCs to durotactically respond to stiffness variations within their local environment. Our findings implicate the mechanical microenvironment as a potent contributor to PDAC progression and survival via induction of PSC activation and fibrosis, suggesting that direct mechanical reprogramming of PSCs may be a viable alternative in the treatment of this lethal disease. Molecular self-assembly is widely used for the fabrication of complex functional biomaterials to replace and/or repair any tissue or organ in the body. However, maintaining the stability and corresponding functionality of these kinds of materials in physiological conditions remains a challenge. Chemical cross-linking strategies (natural or synthetic) have been used in an effort to improve their structural integrity. Here we investigate key performance parameters of different cross-linking strategies for stabilising self-assembled materials with potential biomedical applications using a novel protein-peptide co-assembling membrane as proof-of-concept. From the different cross-linkers tested, the natural cross-linker genipin exhibited the best performance. This cross-linker successfully enhanced the mechanical properties of the system enabling the maintenance of the structure in physiological conditions without compromising its bioactivity and biocompatibility. Altogether, we provide a systematic characterization of cross-linking alternatives for self-assembling materials focused on biocompatibility and stability and demonstrate that genipin is a promising alternative for the cross-linking of such materials with a wide variety of potential applications such as in tissue engineering and drug delivery. CMBL presented ExoSonic – a microfluidic device for early detection of pancreatic cancer at STEM for Britain – a forum for frontier research in the UK Houses of Parliament at Westminster, London. March 2017. CMBL leader, Armando del Rio Hernandez, was a keynote speaker and discussion leader at the Gordon Research Conference - Physical Science of Cancer - that took place this week at the Hotel Galvez in Texas. Antonios Chronopoulos represented CMBL at the European Institute of Innovation and Technology (EIT) Health summit. He presented our group's project, Exosonic. Our latest article, published in Scientific Reports. Read it here. In this paper we have demonstrated how the behaviour of cells can be controlled by carefully altering the length the linkers that attaches them to the surface which they are plated on. The response of cells to physical changes in their surroundings, notably stiffness changes, is well-documented, and important to a wide range of fields from cancer biology to tissue engineering. Up until now, taking advantage of this cellular response has required the use of complex gels to mimic wide ranges of stiffness. Our technique, by contrast, provides a simple alternative that involves coating the surface you wish to use with specific length of attachment linker that tricks the cell into thinking it is on a softer surface. The potential uses of this technique range from practical uses to mechanistic insights: in tissue engineering this process could be used to change the properties of the scaffold into which cells are seeded, directing their fate in the desired manner; in cancer biology, the precise control that the technique gives us over the cell’s environment allows for detailed investigations into what drives metastasis. Oxford – CMBL's Antonios CHronopoulos won the gold fellowship award from the 2016 European Institute of Innovation and Technology student competition to develop ExoSonic – a joint project with Tyler Lieberthal aimed at the fabrication of a microfluidic device for early detection of pancreatic cancer.